September 19, 2013 - The Supervisory board of Lufthansa, Airbus’ biggest airline customer and operator, has decided to expand and modernize its long-haul fleet with a commitment for up to 55 A350-900 aircraft (25 firm and 30 options). Lufthansa also has the flexibility to convert some of the order to the larger A350-1000. This landmark A350 order comes just six months after Lufthansa made the strategic decision to become an all-Airbus operator for its single-aisle fleet. 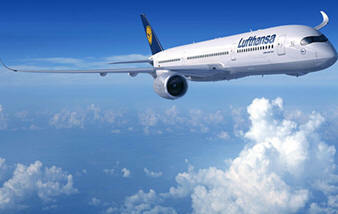 So far in 2013, Airbus has won more firm orders from Lufthansa (125) in a single year than ever before. Taking all commitments (firm and options) into account the figure rises to 232 aircraft one more than the 231 Airbus aircraft currently in operation with the Lufthansa Airline. Lufthansa’s decision today underpins the Group’s status as Airbus’ largest airline customer and operator, with to date 535 aircraft ordered and 397 currently in operation within the Group. The latter include: 282 A320 Family, 42 A330s, 63 A340s, and 10 A380s. Lufthansa has recently announced an order for 100 A320 Family aircraft to switch its Single-Aisle Fleet in the 150-230 size category entirely to Airbus. The A350 XWB (Xtra Wide-Body) is an all-new mid-size long range product line comprising three versions and seating between 270 and 350 passengers in typical three-class layouts. The new Family, whose fuselage cross-section is optimized to accommodate Airbus’ 18-inch economy seat-width for long range passenger comfort, will also bring a 25 percent step change in efficiency compared with existing aircraft in this size category. Scheduled for entry-into-service in 2014, the A350 XWB to date has already won 682 firm orders from 35 customers worldwide.